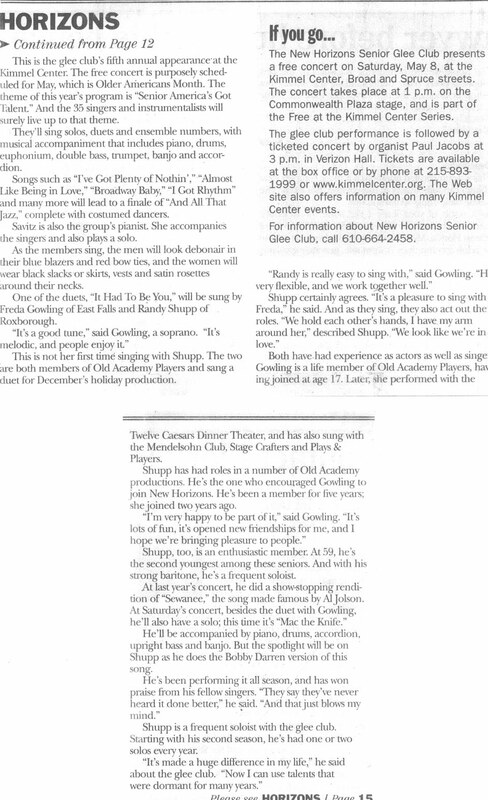 The following article was published in the Narbeth-Bala Cynwyd Patch on April 9, 2013 regarding the Glee Club's Oscar Night performance at Symphony Square (35 Old Lancaster Road, Bala Cynwyd, PA) on April 16, 2013 at 2:00PM. Click here to view the article in its entirety. The music of the movies was the theme of free afternoon entertainment planned at Symphony Square, Bala Cynwyd’s new senior residence located at 35 Old Lancaster Road, Bala Cynwyd, PA 19004. It was performed by the New Horizon Seniors Glee Club, the award-winning ‘ambassadors of music’ from Narberth. In the September 19 - September 26, 2012 issue, City and Suburban News published an article promoting Oscar Night, the Glee Club's program for its 2012 - 2013 season. 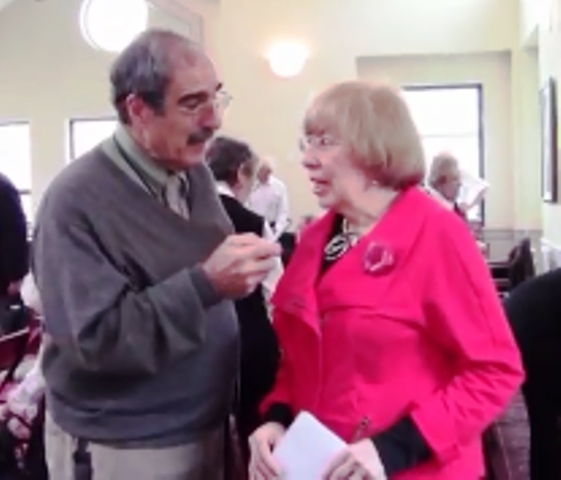 On October 23, 2012, New Horizons Glee Club Director Selma Savitz was interviewed by Bob Gasparro for online newsletter Ardmore-Merion-Wynnewood Patch. To read the full article, click here. Mr. Gasparro made a video of his interview with Selma. Click here to view the interview on YouTube. I recently reviewed a movie playing at the Bryn Mawr Film Institute. The film, Young@Heart, chronicled the joys and travails of a senior citizens glee club located in Massachusetts; the screening was sponsored by the Eastern Pennsylvania Geriatric Society. 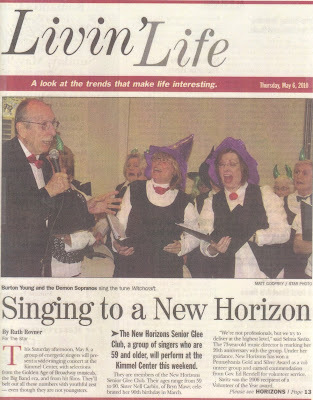 No sooner had I posted the story, when readers informed me that we have a senior citizens glee club right here in Narberth. It is the New Horizons Glee Club which operates from the New Horizons Senior Center. Curious to compare their performance with the film, I traveled to see a performance at the Kearsley Rehab and Nursing Center on Belmont Avenue. The director of the ensemble, Selma Savitz, was kind enough to give our readers an interview and the glee club was kind enough to allow the taping of one of their song performances. I was impressed by the remarkable difference in the vitality of our local group compared with the group portrayed in the film. Nobody in this group from Narberth seemed to be on the verge of their demise. In fact, they showed more vitality than some of my 50-year-old friends. There are those who assert that constant stimulation and new challenges (such as learning new songs and performing in changing musical venues) make for a long and satisfying life. This group certainly seems to support that proposition. The short video clip in this article does not give this group justice. I encourage you to attend one of their live performances. Go here to see their performance schedule. If you would like them to come to your organization, contact Selma at 610-664-2458. Bob Gasparro is an Elder Practitioner (accountant and attorney). He can be reached at Robert.Gasparro@lifespanlegal.com or (484) 297-2050. The following article appeared in the in-house newsletter of Cathedral Village. This community has a very strong music culture which began with the philanthropy of Theodore Presser. A distinguished musician and founder of “Etude” music magazine, he was more commonly known as the printer of sheet music. Early in the 1900s, Presser established a “Home for Retired Music Teachers.” When it closed in early 1980, six months after Cathedral Village opened, the professional music teachers moved to Cathedral Village. With them came their close relationships with musicians from around the world who would come to visit and perform. Accordingly, the Glee Club is very proud of this very positive review. Sitting in our seats in Cathedral Hall on March 4, we were taken on a sentimental journey by the New Horizon Senior Glee Club. With a few talented instrumentalists, some beautiful voices, and bits of amusing "shtick," the thirty-six member group entertained us with songs we all know and always enjoy hearing. They brought back memories of musicians we heard on the radio, played on our phonographs, and saw performing in musicals and dimly-lit cafes. Throughout the Great Depression, World War II and the decade beyond, this was the music we hummed and the Big Bands played, as we danced to the irresistible rhythms. We could say it's part of our DNA, and every time we hear it a special memory returns. Especially memorable on the program were the instrumental solos, the individual interpretations of Lena Horne, Barbara Streisand, Ethel Merman, Marlene Dietrich, and Vic Damone. The male voices were strong and lyrical and added much to our listening pleasure. But it was the energetic enthusiasm and sheer joy of performing that gave this amateur group its contagious excitement. With rafters ringing and the audience swaying, the group joined the soloists in "Hello Dolly," “I Could Have Danced All Night," "So in Love," and "You Can't Get a Man with a Gun"-- plus the music written by Cole Porter and George Gershwin. 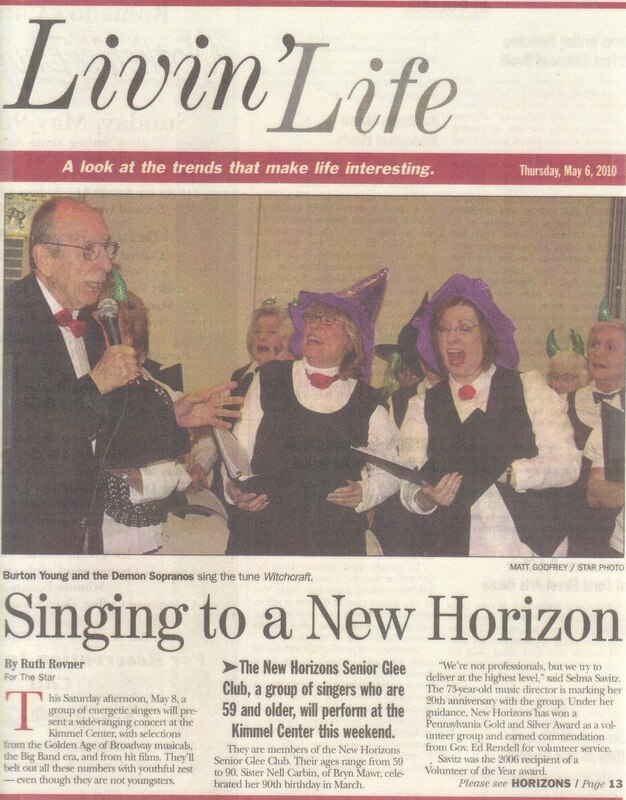 Ruth Rovner and the Main Line Times published this May, 2012 article about the Glee Club, our Kimmel Center performance, and featuring interviews with Director Selma Savitz and key soloist Linda Schwartz. This Saturday afternoon, May 5, a group of energetic singers will present a free concert at the Kimmel Center. The wide-ranging program includes Broadway show tunes plus songs made famous by cabaret stars. The singers will belt out all these numbers with youthful zest - but they are not youngsters. 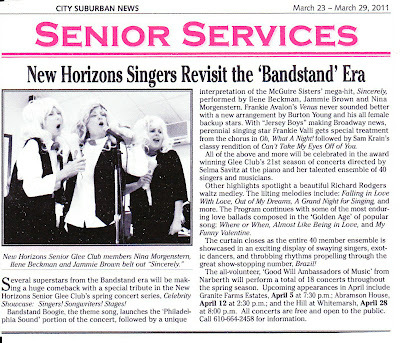 Instead, they are members of the New Horizons Senior Glee Club, and their ages range from 60's to 92. That nonagenarian of the group is Sister Nell Carbin of Bryn Mawr, who celebrated her 92nd birthday in March. "She's as vigorous as any of us," says music director Selma Savitz of Bala Cynwyd, a 75-year-old dynamo herself who has led the group ever since its founding 22 years ago. The versatile Music Director is also the club's pianist. 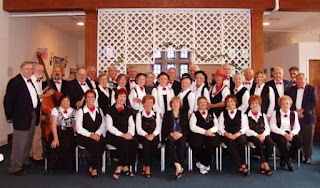 It's an all-volunteer group, and they maintain a busy schedule performing at area retirement homes, churches, synagogues and schools. "We're not professionals, but we try to deliver at the highest level," says Selma Savitz. Under her guidance, New Horizons has won a Pennsylvania Gold and Silver Award as a volunteer group and earned commendation from Governor Ed Rendell for volunteer service. Savitz was a 2006 recipient of a Volunteer of the Year award. This is the club's seventh appearance on the Commonwealth Plaza stage at the Kimmel Center. 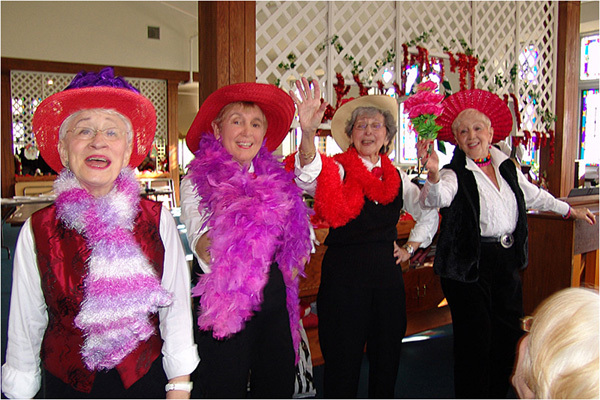 They perform every May during Older Americans Month. The theme of this year's concert is "Broadway Lights, Cabaret Nights". The 35 singers, accompanied by instrumentalists, will perform solos, a duet, and ensemble numbers. "Broadway music is such a gift to American culture," says Savitz, who plans each season's programs. "These songs have stood the test of time, and our audiences love them. And the New York cabaret culture was wonderful, with great entertainers." From that cabaret culture, Savitz chose four selections. Two will be sung by the entire ensemble, and two others by soloists. For another segment of the program, four soloists will perform memorable songs from classic Broadway hits. One soloist is Linda Schwartz [see photo to right] of Bala Cynwyd, whose rendition of "You Can't Get a Man with a Gun," from "Annie Get Your Gun" has been a show-stopper all season. "It's a fun song, it's upbeat, and we all have fun with it," says Schwartz. When she steps into the spotlight, Schwartz will be wearing a red cowgirl hat and black cowboy boots. She'll carry an umbrella which she'll open when she sings the lines "The girls with umbrellas/Are always out with fellas." She'll even tote a gun - a toy one, of course - and she'll swing it around at the beginning of her song. Besides the props, it's her voice and energy that have captivated audiences all season. "When I start to sing, I really get into it, and there's nothing else around me," says the 70-year-old soloist, who 10 years ago sang opera at the Bryn Mawr Conservatory. "She's probably our most dynamic singer," says Savitz, who chose Schwartz for the solo. "She exudes music from every pore. And she thoroughly enjoys putting across this solo for any audience." Schwartz joined New Horizons seven years ago after a friend invited her to hear them perform. She's been a loyal member ever since. "I was enthralled right away," she recalls. "Everyone looked so happy, and they seemed ageless to me." She eagerly volunteered to join the group, and still recalls the first rehearsal with the group. "They were having such fun," she says. "There was such camaraderie, and they were such a beautiful group of people." "Music can be such an important part of life," she says. "It helps to rejuvenate all of us." The group maintains a busy performance schedule. Their schedule for the spring includes 18 different concerts. They've been to senior centers such as the Upper Darby Senior Center and Martin's Run. But they also perform for young audiences such as their recent gig at the AIM School in Conshohocken - an elementary school for students with special learning needs. "They loved our concert!" reports Savitz. "They were so excited to see the instruments and hear the songs." For youthful audiences, the 45 minute program, called "Kids on Stage", includes songs from Broadway shows featuring children, such as "Annie" and "Oliver." Besides the music itself, there is value in the inter-generational aspect, says Savitz. "We're probably older than their own grandparents, and they see us 'oldsters' as enthusiastic performers," she says. "And we're presenting songs that they wouldn't otherwise hear." The seniors have also formed a special bond with the audience at the Veterans Administration (VA) in Coatesville. ""They've been wildly receptive to us," says Savitz, noting that they've been invited back for the third time. On Flag Day, June 14, the seniors will present a special program titled "Stars and Stripes Canteen" for the VA audience. "It's a tribute to the great entertainers of World War II such as Bob Hope, plus traditional patriotic music which honors all branches of the armed forces." But right now the focus is on the Kimmel Center concert this Saturday, when the youthful performers present "Broadway Lights, Cabaret Nights". As in past years, they'll undoubtedly captivate their audience- both loyal fans and newcomers- with their spirit, energy and talent. "The Kimmel Center concert is always very special," says director Savitz. "We're celebrating Older Americans Month. It's also a chance to perform for our friends, neighbors, family members and other guests. So we always give a top notch performance." 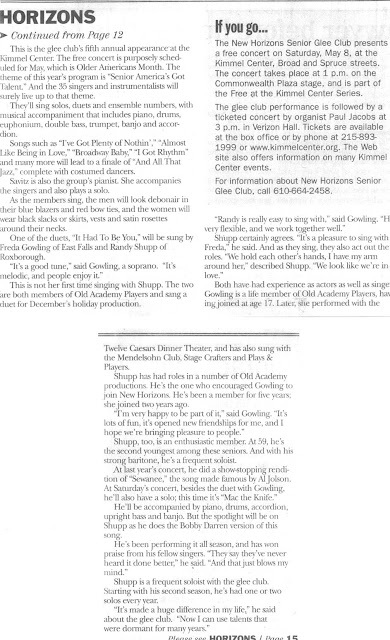 On March 23, 2011, the Glee Club's Celebrity Showcase program was featured in an article in the City and Suburban News. The couple of dozen residents of Kearsley, a nursing home in West Philadelphia, are in wheelchairs. Some are nodding off. Some seem bewildered and confused. But once the New Horizons Senior Glee Club begins singing and swaying, belting out big-band favorites and popular tunes from Broadway, eyes widen, knees jiggle, feet tap, faces smile. The lively "Bumble Boogie" impels Sarah Hart to wave her arms in the air. "I loved it," Hart, 89, says after the concert. "It done something to me, made my spirit rise. It's like the wind. You can't see it, but you feel it. Hallelujah!" Equally pleased are the performers, all happy carriers of the entertainment gene, all radiating joy. "It's a terrific serotonin upper," says Shari Steinberg, 66, of Narberth. "You don't have to take antidepressants if you join the glee club." Jim Bracken, 79, a fine Irish tenor who sang "Almost Like Being in Love" from Brigadoon, says: "Sometimes we perform for people who are so disabled they can't applaud. But you can tell they're thrilled, and that makes you feel like you're doing something worthwhile. We get more out of it than they do." The club's success hinges mightily on the woman who accompanies the group on piano. Burton Young, 81, the apparent love child of Abraham Lincoln and Groucho Marx, resorts to repetition to emphasize his regard: "She's a genius, a genius, an absolute genius." Others describe her as "the glue," "the linchpin," "the heart," "the driving force." The object of their affection is Selma Savitz, celebrating 20 years as the glee club's director. 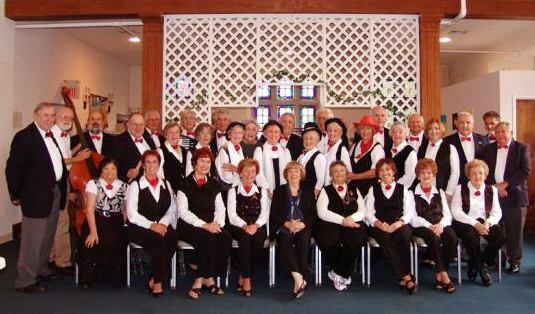 Its members call themselves "goodwill ambassadors of music," and they live up to their name by spreading glee at schools, colleges, churches, synagogues, community clubs, and retirement homes. To view the entire article, including more photos, follow this link. In May 2010, free-lance journalist Ruth Rovner wrote this article for the Star of Manayunk, Roxborough, and East Falls. The glee club will sing solos, duets and ensemble numbers, with musical accompaniment that includes piano, drums, euphonium, double bass, trumpet and accordion. The program will feature selections from the “Golden Age” of Broadway musicals, the Big Band era and from hit films. Songs such as “I’ve Got Plenty of Nothin’,” “Almost Like Being in Love,” “Broadway Baby,” “I Got Rhythm” and many more will lead to a finale of “All That Jazz” complete with costumed dancers. A number of the solos will be performed by Main Liners like Burton Young of Wynnewood and his wife Jeanie, Linda Schwartz of Bala Cynwyd, Ron Scott of Villanova and Ilene Beckman of Havertown. Dancers include Barbara Browne of Gladwyne and Nina Morgenstern of Wynnewood. Winnie Moss of Ardmore will serve as emcee, introducing each number. “She has a great voice and stage presence,” says Savitz, noting that Moss is also chairman of the glee club. Savitz, the versatile music director, is also the group’s pianist who will accompany the singers and also play a solo. Costuming is part of the show, the men will look debonair in their blue blazers and red bow ties and the women will wear black slacks or skirts, vests and a satin rosette around their necks. Beckman has performed this solo at previous glee club concerts this season and she’s accustomed to curious looks from audience members when she takes her place on the stage with the other singers. “People stare at me from the get-go,” she says. And when she gets up to sing, she purposely starts to fluff her curls before she even sings a note. 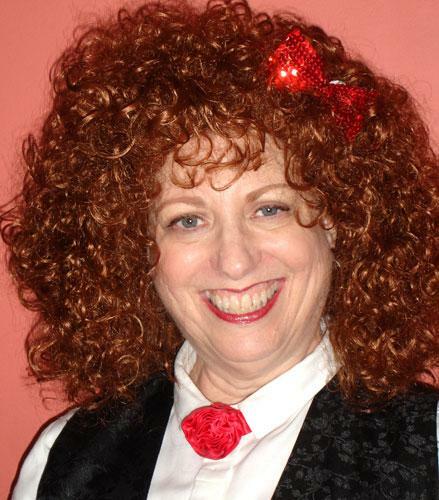 “The wig is my ticket to Annie and I want to get into character as Annie — not as a senior,” says the 63 year old singer. For the big finish she does a curtsy. “I enjoy being dramatic, and I wanted to create my own Annie,” she says. 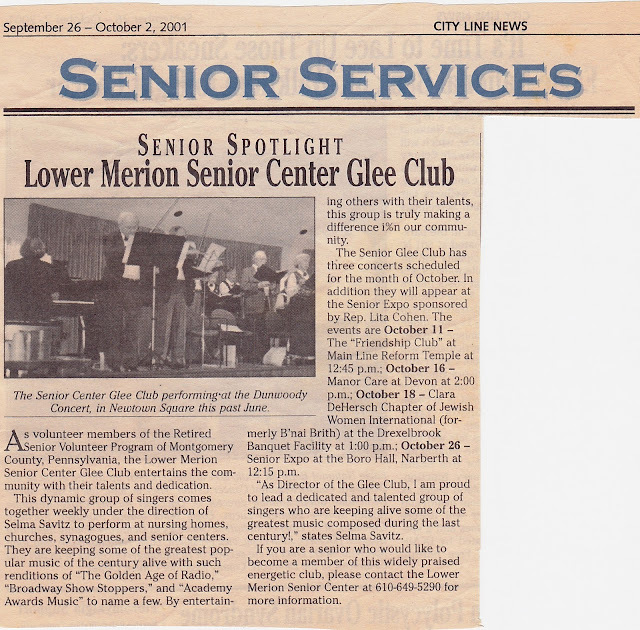 The Glee Club was called the Lower Merion Senior Center Glee Club back in 2001 when the City Line News ran this article about us.